At Henham in Essex, 5 miles beyond Bishops Stortford in Hertfordshire, and a little above a Mile from the Great Road, leading from London to Cambridge, is to be Sold, a Copyhold Estate of Inheritance, of 80 l. per Annum having a very good Dwelling house, and Outhouses upon it, all in good Repair 10 l. per Annum thereof is Freehold. Enquire at Jack's Coffee house in King Street, or at Mr. Thomas Archers in Henham aforesaid. 1728 The London Gazette from Tuesday January 7th to Saturday 11th. Trustees Office, Broad Street, December 19th 1728. The Trustees appointed by Act of Parliament for the Sale of the Estates of the late Directors of the South Sea Company and others, give Notice, that they intend to expose to Sale by Cant or Auction, to the best bidder, in the Hall of the South Sea House, on Wednesday the 15th Day of January next, at Ten of the Clock in the Forenoon, the Several Estates following, viz. Several Freehold Lands and Tenements at Putney in the County of Surrey, late the Estate of Sir Theodore Johnson, Knight and Baronet, one of the said late directors. The Manor and Rectory of Henham, in the County of Essex, and a Freehold Farm called Broom Farm, in the same County; a Copyhold Estate in Ratcliffe, in the County of Middlesex; a Freehold House in Angel Court, St. Catherine's, in the same County; a Freehold Estate called the Downes, consisting of Several Lands and Tenements at Rotherhithe, in the County of Surrey, late the Estates of Sir John Blunt, Baronet, one of the said late Directors. A Farm, in the Parish of Henham, nigh Stansted Mount Fitchet, in the County of Essex: containing 160 Acres of Land; the House, &c. in good Repair, and may be entered upon immediately, the late Tenant being dead. Enquire of Beckford Kendell, Esquire, at Moor-End, near Great Dunmowe, Mr. Howlett, at Ellingham, or Mr. John Vaux, at Hockerell. 1765 12th Oct. Ipswich Journal – Chelmsford – John Salmon of Henham, butcher, who was convicted of using false weights, stood in the pillory in the market place this day, from 12 to 1 o’clock. 1771 30th July Manchester Mercury – We are informed that the following incident, strange as it may appear, is an actual truth; at Chickney, near Henham Mount in Essex, in a poor man’s house there was found 28 snakes and adders in a bed where a little child lay, who was taken from them without having the least hurt; and what is more remarkable, in a room adjoining, there were found near 100 frogs and toads crawling about the floor, no one being able to account for this uncommon phenomenon. 1771 28th Dec. Ipswich Journal – Chelmsford – On Tuesday was committed to Chelmsford gaol, by James Watt. 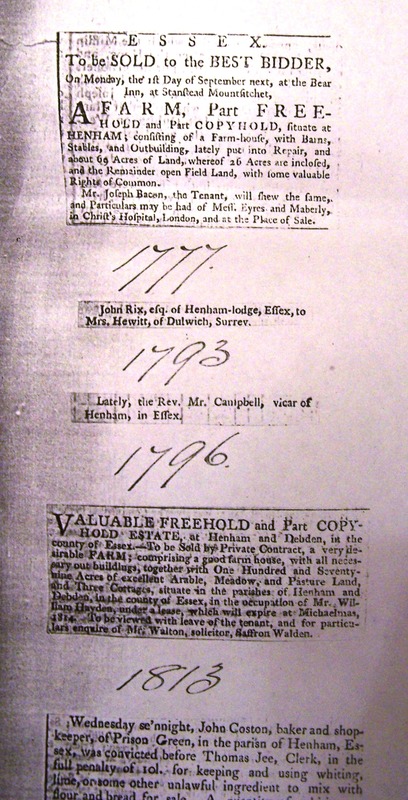 Esquire; Daniel Halls, of Henham in that county, being charged on the oaths of Robert Brand, Thomas Claydon, and Mary Bacon, on suspicion with entering the dwelling-house of Ann Canning, widow, of the same place, and stealing from thence three pecks of wheat flour and a peck and a half of bran. COLCHESTER, May 10th. - Tuesday last dies at Harlow, the Rev. Mr. Wise, rector of Harlow and Henham, in Essex. 1776 21st Sept. Ipswich Journal – A few weeks since the Rev. Wasey Sterry, A.M. of Magdalen laver, was presented by Mrs. Feakes of Durringtons, to the vicarage of Henham, in this county, void by the death of the Rev. Mr. Wise. 1779 8th Feb Reading Mercury – Monday afternoon died suddenly, at Henham in Essex, the Rev. Mr. Sterry, minister of that place. 1780 1st April Ipswich Journal – Chelmsford –Yesterday an inquisition was taken at Henham, on George Dennison, a child of 4 years old, who was accidently drowned. CHELMSFORD Dec. 7. A few days since was married the Rev. Mr. Campbell, vicar of Henham, in this county, to Miss H.M. Bullock, of Dry Drayton, near Cambridge. 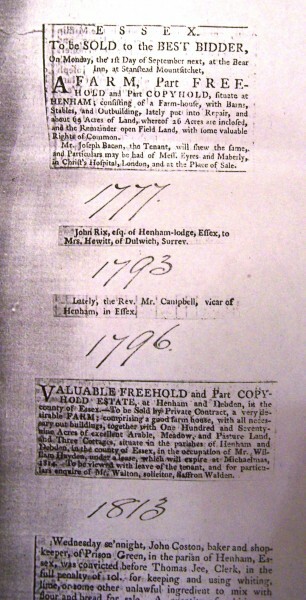 To be sold by auction by John Barnard, on Friday the 13th day of February, 1784, at Three o'clock in the afternoon, at the Sun Inn, in Thaxted, Essex. Two Closes of land, or Parcels of FREEHOLD ARABLE LAND, containing nine acres and 13 poles, more or less, lying in Chickney, in Essex, now in the tenure of James Barker, who will show the premises. Further particulars, with conditions of sale, may be had of Mr. James Wood, at Henham, or of the auctioneer, at Little Bardfield Hall. Lot 2 A small farm, situate in Henham, in the county of Essex; consisting of a good farm house, let off in tenements, good barns, stables, and other outhouses, and about 36 acres, more or less, of exceeding good arable. Meadow, and pasture land, about 10 acres freehold, and the rest copyhold, and now let to one Abraham, Bett, at the clear yearly rent of £28, tenant does all repairs, and pays all taxes and outgoings whatsoever. The tenants will show the premises, and for further particulars enquire of Mr. Durham, attorney at law, at Ipswich. In the county of Suffolk. Whereas Daniel Hallybread did escape from a Constable in the parish of Henham, in the county of Essex, on the 13th Jan 1787; he is about 5 feet 10 inches high, and flight made; had on a drab coloured coat, red waistcoat, and corderoy breeches, and round hat; wears his own black hair tied behind, is of a pale complexion, and is about 30 years of age. Whoever apprehends the said Daniel Hallybread, and brings him to the constable of Harlow, in the Type county of Essex, shall receive TEN POUNDS Reward, by me Benjamin Wood, Constable. Note: had been the governor of several workhouses in Essex, and is well acquainted with the yarn and woollen manufactory. ESSEX. To Be SOLD by AUCTION, By John BARNARDS, On Friday the 30th March instant, at Three o'clock in the afternoon, At the Sun, in Thaxted, A MESSUAGE and COTTAGE, tiled, with a Barn, Orchard, and Yard, and Ten Acres of Land, part freehold and part copyhold, in HENHAM, in Essex, in the occupation of John Salmon and others, tenants at will, with a great number of thrifty pollard trees thereon, subject to a quit-rent of 10s. per annum and to fines arbitrary on admission to the copyhold part.